Smilin' Mood Phone Strap Dude stretches to fit most cell phone styles. 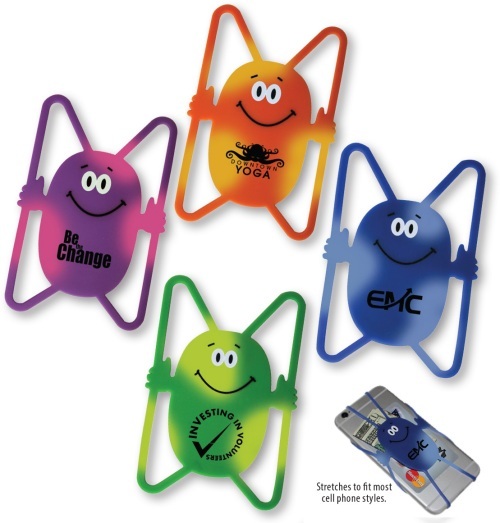 Mood Strap Dude is a colorful electronic phone accessory that prevents your cell phone from sliding. It changes color by the heat of your hand. Phone Strap Mood Dude is available in green changing to yellow, purple changing to pink, blue changing to white or orange changing to yellow. Imprint Colors: Due to the color change, white imprint is not recommended on this product. black, red, light blue, medium blue, dark blue, light green, medium green, dark green, brown, purple, yellow, teal, orange, maroon, athletic gold, gold, silver.